Edward Chamberlayne died in 1703 and the business of continuing to update and publish Present State of England fell to one of his sons, John (c.1668-1723). In 1704, Mary II’s sister and William III’s cousin, Anne, had been Queen for two years. Here she is in the frontispiece for the twenty-first edition. Her portrait was engraved by eminent English artist, Robert White (1645-1703), and was possibly a reused plate since the volume was published after his death. White was a prolific engraver, producing over 400 images during his career, including a portrait image of Queen Anne’s husband, Prince George of Denmark. 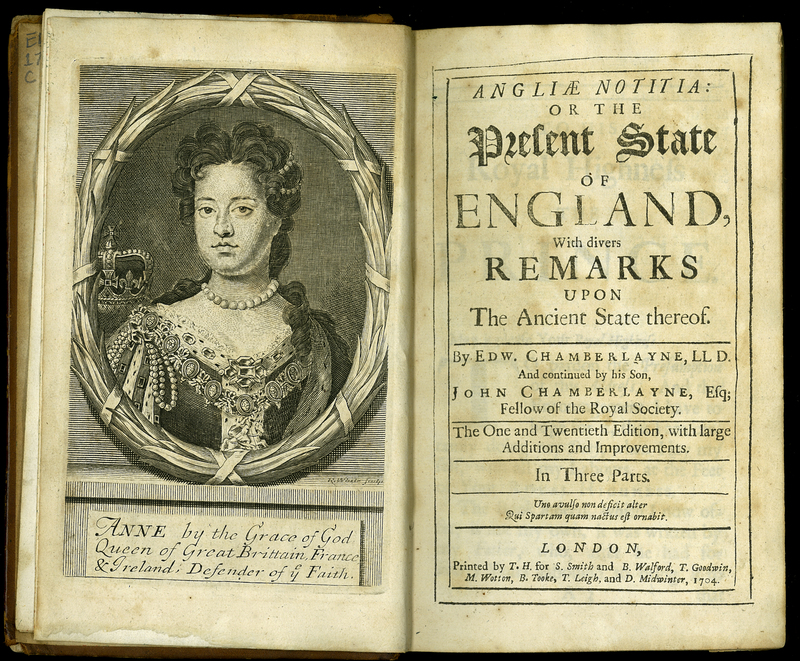 Edward and John Chamberlayne, “Angliae Notitia: or the Present State of England. [Twenty-first edition],” ourheritage.ac.nz | OUR Heritage, accessed April 24, 2019, http://ourheritage.ac.nz/items/show/10684.